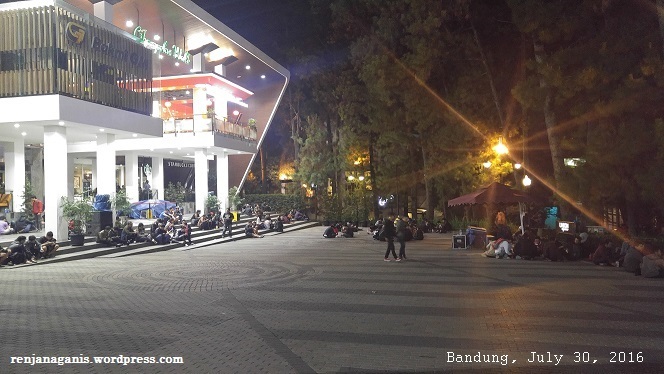 Until one day in the last weekend of July, when I went to Bandung with my husband, we experienced the most attractive place to play Pokémon Go. Actually I had a personal business at campus on Friday and was invited to my friend’s wedding ceremony on Saturday of that weekend. 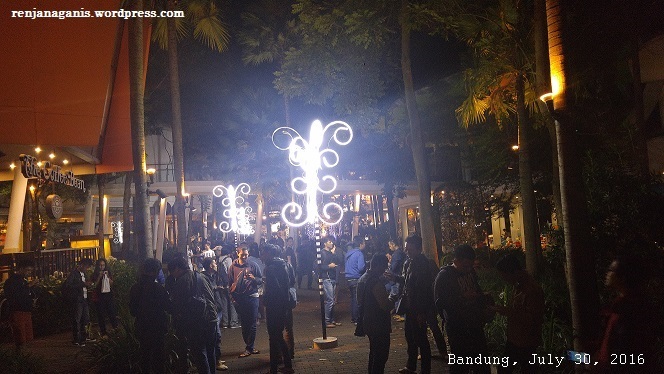 Therefore I had been decided in days before the weekend to book a hotel near the Cihampelas Walk a.k.a Ciwalk. 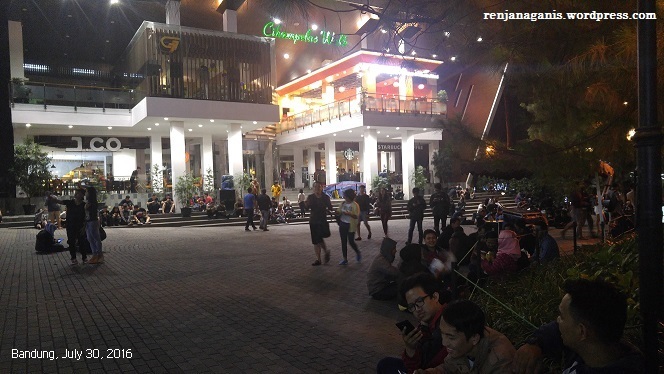 At first I hadn’t chosen the hotel we’d like to stay yet then a friend suggested me to stay near Ciwalk if me and my husband wanted to play Pokémon Go too. 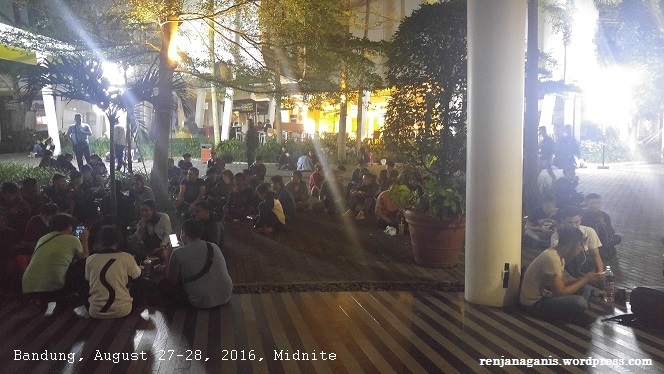 My friend said that at Ciwalk, there are 24 hours Lure Parties even on weekdays. 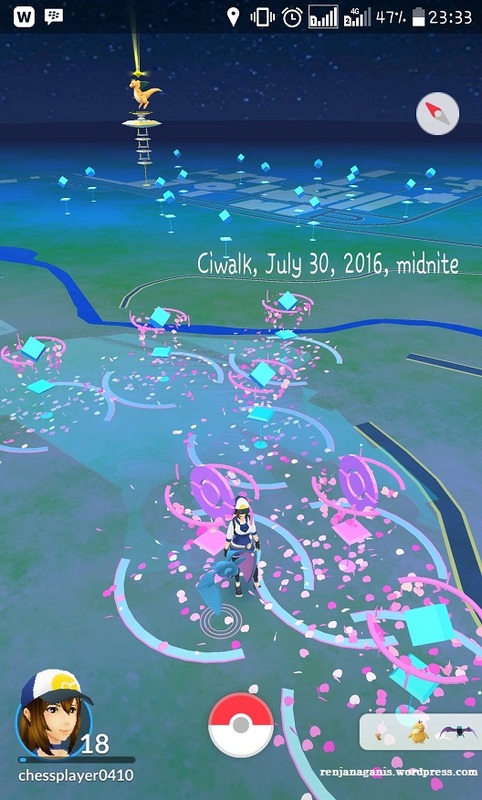 Lure Party is an action of the game by using Lure Module that applied at each PokéStop. It could attract some Pokémons around to appear. If you’re lucky, the rare Pokémon would be appeared. And…..it happened! 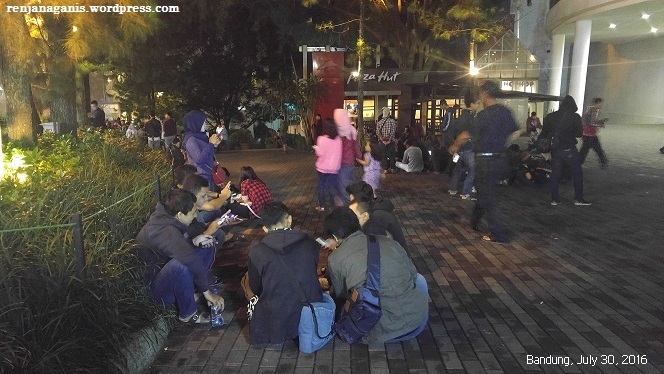 I saw beautiful lure parties appeared on my smartphone screen. Look! My husband and I then decided to get a seat around the central park. The Ciwalk Mall has a concept indoor and outdoor mall, so that’s why it has a kind of central park and some pathways inside the mall. In the middle of playing time, suddenly we’re surprised by a friend who’s playing the game too with his friends. Suddenly he came and accosted us. We’re not talking much but yes, we discussed anything about Pokémon Go. That time was about a month since the game has been released. On that time also I was pretty sure that people all around the globe were playing this game with great enthusiasm. 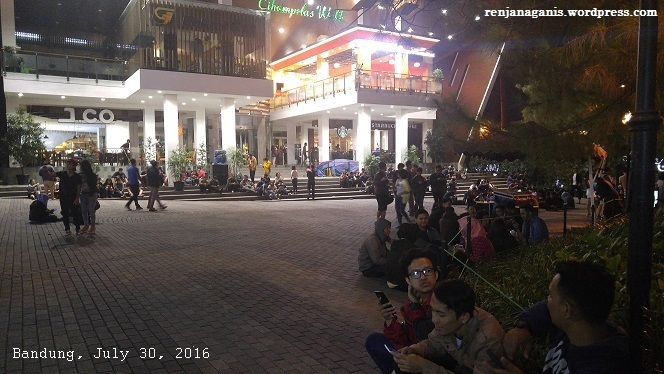 These pictures below will show you how enthusiasm of Bandung people when they play Pokémon Go. 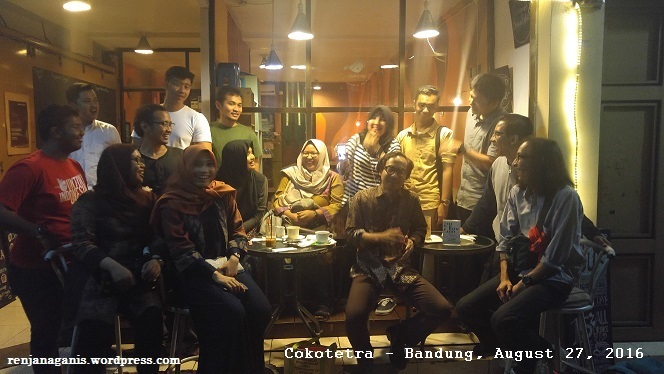 The wedding ceremony was held at 07.00 PM until 09.00 PM, but after that I didn’t directly go back to hotel with my husband because my friend, Alif, invited me to attend a small conference of our alumni group at his Coffee Shop, Cokotetra at Dago that actually had been started since after Isya’ pray time, about 07.30 PM. Of course I wasn’t alone by myself as the only woman on that informal meeting, but I was with my senior high school girl friends, Ichi and Fine. Fine is a new Mom, but she’s still like to attend some events that related to Krida (my senior high school) friends while having reunion. She’s lucky, her husband is always support her that can make her easily to come to those events without much worrying about baby-sitting of her little son while she’s enjoying the moment with friends. Everytime I saw her appearance at events I attended, I made a promise that someday, I also won’t stop for attending friends’ events, even my babies have born. 🙂 And that night, she brought Emir, her baby-son who’s sleeping. So cute! ^-^ She and her husband weren’t hurrying themselves to went back to hotel after the wedding party, but decided to came by at Cokotetra for awhile. Then how about my husband? 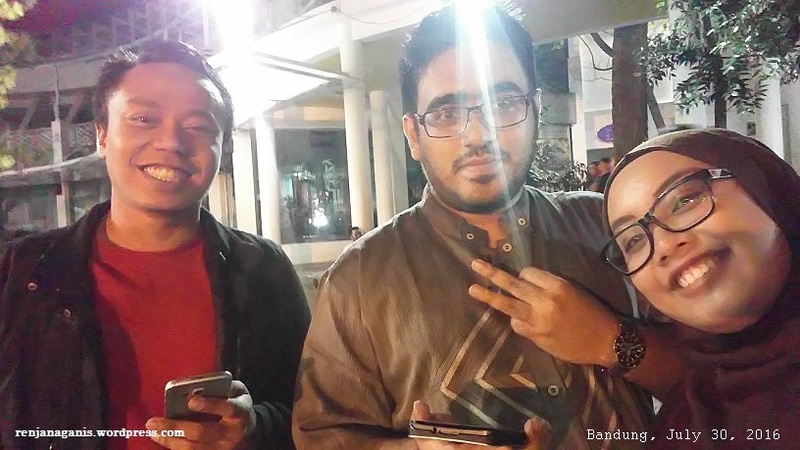 Yes, of course, he’s directly went to Ciwalk and playing Pokémon Go immediately. Ha-ha. 😀 At about 10.30 PM we ended our small meeting at Cokotetra then Alif and Ichi accompanied me going back to hotel at Cihampelas. Today, I don’t know is anybody still playing this game with great enthusiasm or not. But for me and husband, we’re still playing it although it is not as enthusiastic as before. Now he’s on Level 26 and I’m on Level 23. The higher the level we’ve got, the more difficult to raise the level up, therefore I’m becoming not as enthusiastic as many weeks ago, but surely I don’t feel bored. I’m still playing it but rarely. However, the developer of this game had made some updated of some features so can make Pokémon Go becoming more attractive, such as the “Buddy” feature.